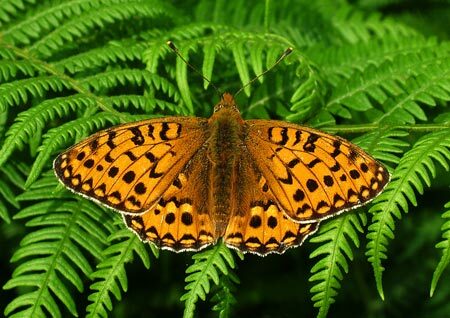 Special features: The dark green fritillary gets its name from the olive-green patches, dotted with pearly-white spots, on the undersides of its wings. It is similar in appearance to the silver-washed fritillary, but smaller and with more rounded forewings. The dark green fritillary is noted for its fast flight. Distribution: Scattered throughout the U.K., especially in coastal locations. Less commonly seen in eastern areas. Months seen: June to September. Habitat: Heaths, cliffs, downs and meadows. Food: Nectar. The black spiny caterpillars feed on violets.